The Australian Karen Organization (AKO) said it supports the efforts to urge the UN to refer the Tatmadaw to the International Criminal Court (ICC) for the alleged genocide of ethnic tribes in Burma including the Karen. 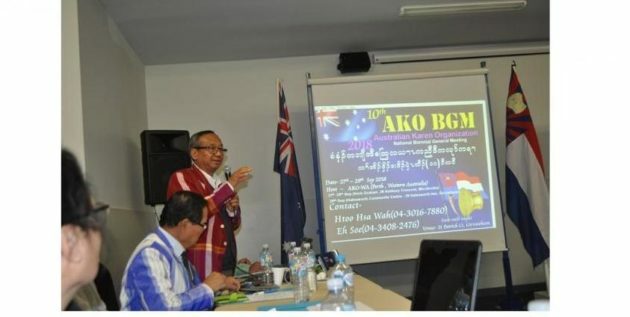 The AKO chair Saw Lwin Oo said this in his opening remarks at the organization’s 10th General Meeting held in Perth, Australia on September 27-29. “We support the submission of proposals to the United Nations to refer the Burmese Army (Tatmadaw)’s [alleged] genocide of ethnic people in the Karen, Kachin, Shan, and Rakhine states. The Burma Army’s genocide really exists. The AKO is showing its support because similar genocide has been committed in the Karen State and other areas for several decades,” he said. Forty-six people attended the AKO’s general meeting including the delegates of six states in Australia, observers, and a guest from the United States. Respective delegates of the states discussed the two-year activities of the AKO, gave recommendations, and elected new executive members who will serve the organization from 2018 to 2020. The delegates engaged in an extensive discussion on the peace processes, which are being implemented between Myanmar government and ethnic armed organizations, and denounced the Tatmadaw for carrying out territorial control in the Karen National Union (KNU)-controlled areas during the period of peace implementation. “Karen New Year celebrations and Karen traditional wrist-tying ceremonies can be held freely in the country now due to the peace process, which is carried out by the KNU and the Burma government. On the other hand, the Burma Army (Tatmadaw) has been expanding its control on Karen territories. We have found that the Karen territories are slowly becoming narrower due to the construction of roads and bridges in order to carry out faster mobilization of its armies,” said Saw Lah Khu Ju, who attended the meeting. After establishing the AKO in 1996 and officially registering it in 1998, the AKO has been working for the Karen affairs. The AKO’s general meeting is held biennially.